Warning: This Extension requires the use of exec() and also requires you to install Xpdf (upload a file to a non-public location) yourself. 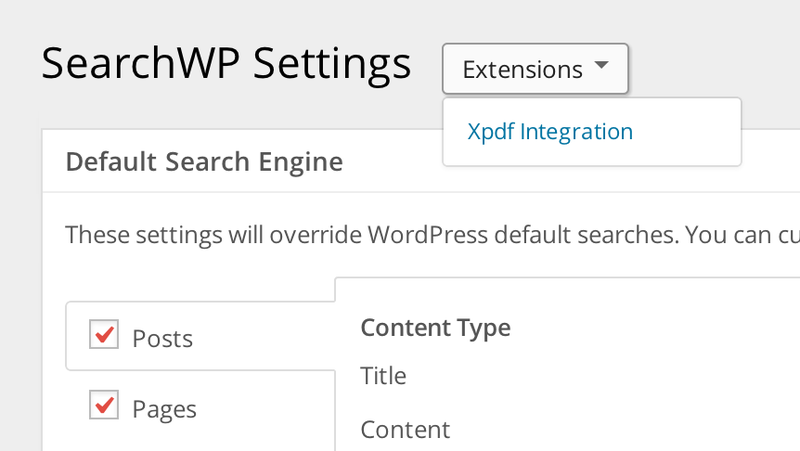 SearchWP offers the unique feature of extracting plain text from PDF files uploaded to your WordPress website. Out of the box, SearchWP attempts to do this using only PHP, but due to the complexity and variation of the PDF format that sometimes results in content not being accurately extracted. Enter Xpdf. Xpdf is a command line utility that must be installed on your server in order for this Extension to work. Installation is simple, and instructions are included. Using the Xpdf Integration Extension you can offload all the work PHP has to do in processing your PDF files to Xpdf, which is extremely fast and accurate when extracting content from your PDFs. After activating the Extension, you will need to follow the installation instructions. Once installed, SearchWP will offload the PDF content extraction process to Xpdf. 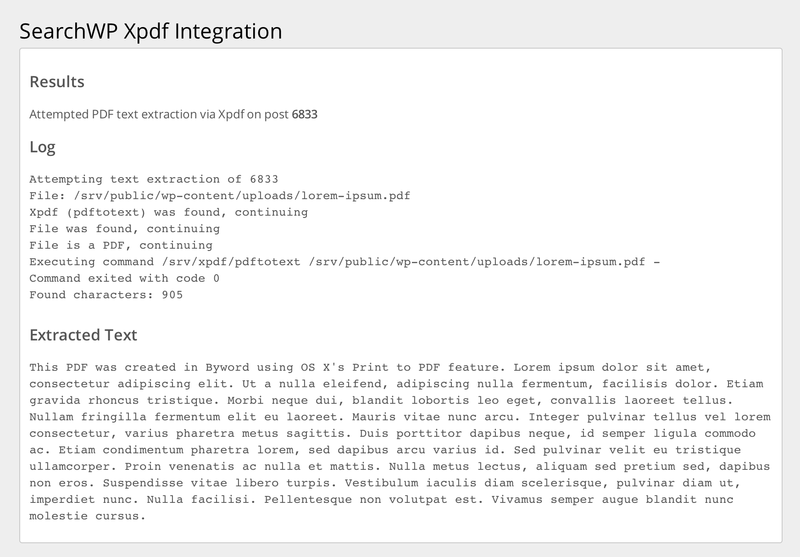 Using this extension you can utilize Xpdf to extract the content from your PDFs. Xpdf offers binary distributions of Xpdf tools for both Windows and Linux at http://www.xpdfreader.com/download.html. The last step is to tell SearchWP Xpdf Integration where you installed Xpdf. Add the following to your theme’s functions.php, replacing /path/to/pdftotext with the actual path to the pdftotext binary (not the folder) on your server. If the log displays a point of failure, please include that in any support requests you submit. [Change] Xpdf is now XpdfReader which resulted in a change in command formatting. YOU MUST UPDATE pdftotext AS WELL. Please view the Xpdf Integration documentation for a link to the XpdfReader website to download an updated version.